For many, coming to University can be the first time they have not only just lived away from home, but also the first time many people have had to move into a completely new city and flat with complete strangers. Thats how it was for me anyway. Adding to the mix is 'freshers'. Freshers is a week or a fortnight that gives students and introduction into University life. 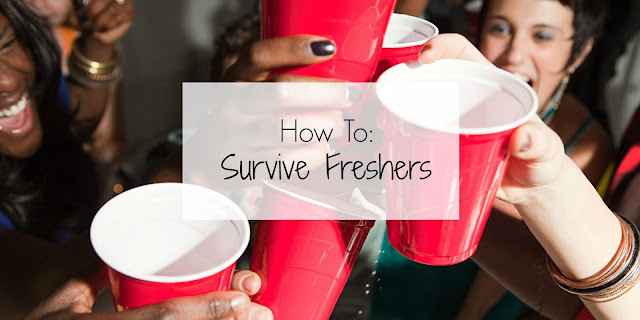 Freshers can be so much fun and such a great away to meet new people and make amazing memories, but it can also be quite dangerous seeing as you are with strangers and in a unfamiliar setting. So I thought I would share with you my top tips on how to survive freshers! Side Note: I only just survived freshers as I ended up in A&E with severe freshers flu, so I may not be the best person to be giving out advice! 1) Never go anywhere alone, always try to stay in groups of two or three at least. 2) Never leave your drink unattended. The last thing you want is to get your drink spiked so always carry it, and if you have a bottle, I suggest resting your thumb on top of it. 3) Keep your flat/house key in a safe place. I suggest keeping it in a zipped area of your bag if you can, so that it doesn't fall out when you're rummaging through it! 4) Make sure you're eating enough- it's so easy to get ill during fresher's, you need to fuel your body with the right stuff and keep your immune system up! 5) Leave yourself a glass of water by the side of your bed before you go out. The drunk you will definitely appreciate it! 6) Bring your favourite DVDs to uni and have your favourite snacks on standby for those homesick/hungover days. 7) Don't take out your bank card with you on a night out. Draw out some cash beforehand to limit yourself. Contactless can be your worst enemy on a night out (trust me, I know!). 8) Don't be shy. Make the effort to introduce yourself to someone, as the likiihood is, everyone will be feeling just as nervous as you are! 9) Make sure you have the number of a good taxi company stored in your phone. 11) Make sure you get enough sleep! Fresher's is full of late nights and that's usually one of the ways people get ill, as they don't give their body chance to recover before going out again. 12) Know your limit. Remember that you are most likely in a completely new place with completely new people so be extra aware of yourself and your surroundings! Finally, make sure you have fun! Fresher's is one of the best weeks (two if you're lucky!) of university and you can make friends and memories for life, so make the most of it, but be safe! I hope you enjoyed this post and best of luck with uni!